Cloth room partitions have been around for decades to make better use of interior spaces, while also allowing for visual and acoustical privacy. We’ve seen them come–and mostly go–in one clumsy, outdated form or another to serve such diverse settings as schools, offices, healthcare facilities, places of worship, and government buildings, to name a few. At Cubiture, we carry cloth room partitions that are even more versatile, and with a more modern and elegant look, bringing you the best in visual appeal and utility. There are many beautiful materials available for room partitions these days, but cloth room partitions may still be the most popular. Our selection of fabrics at Cubiture only makes this even more so, given their great advantages. Perhaps one of the biggest benefits of using cloth partitions is the degree of noise control you get. This makes cloth room partitions highly flexible in application since there are so many instances and events where one or many people need protection from unwanted environmental noise. It could be that you just need some extra sound control in an office workstation, either to keep you on task in the midst of distracting surroundings or as a way to keep important and confidential conversations within the walls of your workspace or office. The cloth room partitions we carry, depending on model and makeup, can be perfect for those working in the radio and recording industry. Whether you’re a sound engineer, a talk radio host, a musician, a podcaster, or a Youtuber, nothing is more important than the nature and physics of sound in producing a high-quality product that conveys your thoughts and ideas to a potentially vast audience. With the help of some of our more acoustically-inclined cloth room partitions, professionals and amateurs alike are more able to reach that objective. Visual privacy is another great benefit with cloth room partitions. If we were to take the case of an office employee, we tend to think that they only want a noise-free space so they can focus in their daily duties. However, giving visual protection is also instrumental in productivity. Not only does it help block the many visual distractions that are sure to be present in a busy office, but it also keeps you protected from the prying eyes of supervisors and coworkers. If living in a shared space with a stranger, cloth room partitions can add a degree of privacy in common spaces, for when one tenant is entertaining guests or the other is studying for an exam or taking home work for their job. Feeling like one is constantly watching you is sure to increase stress levels and feelings of vulnerability, and that tends to affect one’s productivity and well-being. With cloth room partitions, users can enjoy a little extra privacy and freedom to restore these positive states of mind. Cloth room partitions are also more expressive than other materials. Available in an infinite array of colors, in various shades and saturations, this material can accommodate any number of design themes and go with just about any décor you can muster for your space. A company that wants to weave its sense of branding throughout their office’s interior will have no problem finding a cloth room partition that will enhance the colors of the company logo. You can also apply color psychology to your spaces. If you have a private medical practice with a lobby space, you can employ cloth dividers in a number of softer, cooler color choices to convey a sense of comfort and calm to visitors and patients. A gym can use cloth room partitions in warm and vibrant colors to instill a motivation, energy, and optimism while separating large spaces based on different fitness activities. An added dimension of expressiveness comes in the readiness of cloth to accept push pins. This gives any cloth room partition the ability to go from simply a space separator to a highly personalized backdrop showcasing one’s personality and ideas. Primary schools can use these partitions as walls for students’ artistic and academic achievements during open house events. Institutions of higher learning can also use them as walls for a variety of presentations or in gallery settings. In the office, employees can tack all sorts of items to the walls of their cloth room partitions, such as family photos, their children’s artwork, a calendar, various notes, and lunch menus. Cloth room partitions also bring a sense of coziness to a space. Whereas other partitions such as polycarbonate or glass can convey a very sleek aesthetic for businesses in dynamic, forward-thinking industries, they can also lend a sense of coldness to the environment. Cloth can contribute to feelings of familiarity to a space while softening its appearance. Our more popular cloth room partition types are our super-flexible portable acoustical fabric folding dividers that can be used virtually anywhere. The key to this type of divider’s versatility is the system of patented 360-degree hinges found between each panel, allowing for a level of flexibility never before experienced. Almost any configuration you can come up with is possible with one or multiple of these units, such as angled “L,” “C,” and “S,” shapes, not to mention simple straight lines and graceful curves. The acoustical fabric is a three-layer cloth room partition system composed of a honeycomb core that helps to block sound, surrounded by layers of polyester, and finally wrapped in an outer layer of FR701 Acoustical Fabric for an NRC (noise reduction coefficient) rating of 0.6, denoting that it absorbs more sound than it reflects. On top of its excellent acoustical performance, this cloth room partition is easy to transport and store, thanks to the non-marking casters which can lock the lightweight aluminum frame in place. Patented full-size end panels stay at right angles to the length of the partition to offer more stability and safety, while no-pinch seams keep you from injuring your fingers as you expand and collapse this partition as necessary. There are a number of widths as well as panels, that you can specify for this type of partition depending on which specific type you select. There are also sliding versions available, and even wall-mounted versions, for when you need a more stationary option of cloth room partition. There’s a wide variety of cloth room partitions that utilize this acoustical fabric, including our massive wall-mounted folding or sliding wall which helps to separate large spaces into functional sub-units within buildings as an office, a warehouse, or a school. This large-scale partition can be paired up with another and mounted at opposite ends of a space in order to divide vast areas of space when just one unit isn’t enough. It’s also one of our tallest cloth room partitions, specifiable at a height of over 12’. Because no ceiling track is necessary, the top portion stays free and open to allow air to circulate between the divided spaces. We also carry various cloth room partitions in the form of a highly configurable portable cubicle partitioning system, as well as small-scale single-, double-, and triple-panel dividers that are perfect for setting up between two workstations. Perhaps you’re looking for a cloth room partition that has nearly all of the amazing features found with our premium acoustical fabric partitions but simply don’t have the budget to enjoy them in your home or workplace. Take a look at the economical canvas alternatives that Cubiture also carries, so that you can get the most out of your room-partitioning furniture without sacrificing a bit of quality or style. It’s true that our canvas products won’t absorb as much sound as our cloth room partitions made of acoustical fabric, but they are just as responsive and flexible as the best that we offer, thanks to the patented 360-degree hinge system that allows for a full range of movement of each panel and which is featured among our more costly partitions. This is the case with our portable folding cloth room partition, as mentioned earlier. This folding, portable canvas cloth room partition is available in two lengths of 6’ or 10’ as well as heights of 4’, 6’, and 6’10”. It’s also a lightweight partitioning system that makes it easy for anyone to operate, transport and store. Framed out with 16-gauge 1.25” round steel tubing connected by corner joints of rounded plastic for enhanced sturdiness and safety, the durable, lightweight 100% cotton canvas panels are replaceable and flame-retardant. The entire composition makes for a highly sturdy and easily portable cloth room partition, with durable dual-wheel non-marking casters that can lock in place just where you need them. For even more stability, this canvas divider also includes patented full-sized end panels. Velcro fasteners allow multiple units to be connected together into a long wall, so that large amounts of people can be divided in large spaces. This is perfect for gyms where multiple activities could be taking place in the same open space. Very few tools are needed to build this partition, and when it’s done, it only needs less than four square feet of floor space to occupy for storage. Other canvas cloth room partitions include our rolling single-panel partition, set at a single dimension of 6’x6’, as well as our non-rolling varieties. Our three-panel folding partition stands in direct contact with the floor while our two-positon 4’x6’ partition gives you the choice of a tall and skinny barrier or a short and wide one with a single rotation about a tubed footing at its corner. Despite the small range of available colors—red, black, blue, and beige—our canvas cloth room partitions will still fit well among a multitude of different settings. Choose brighter colors for children’s activity areas and darker colors for museums, auditoriums, offices, and so on. These can be excellent as walls that showcase what you have to offer in presentations, craft fairs, and art shows. These cloth room partitions are also excellent low-cost crowd-control measures for large events such as concerts, job fairs, comic book conventions, and trade expos. For when you need more heavy-duty acoustical performance, you can opt for several panels we carry for optimum noise control in professional recording studio settings or even just any workstation that demands peace and quiet in a noisy office environment. Even if you’re a musician or podcaster who records from home, our acoustical cloth room partitions excel at providing a recording haven. From end to end, these acoustical cloth room partitions stay in full contact with the floor in order to provide top-notch sound confinement. These multi-panel partitions are composed of an acoustical foam core wrapped in an outer layer of heavy E-84 firesafe ribbed fabric, making up an NRC rating of 0.65. Whether you’re conducting a business meeting, exhibiting fine art, recording a demo, or engaging children in a lesson or story time, Cubiture has a cloth room partition that is sure to suit the unique needs of you and your users. With the number of acoustical fabric or canvas panel compositions, along with a variety of sizes and styles, our partitions will fit any setting or scale. 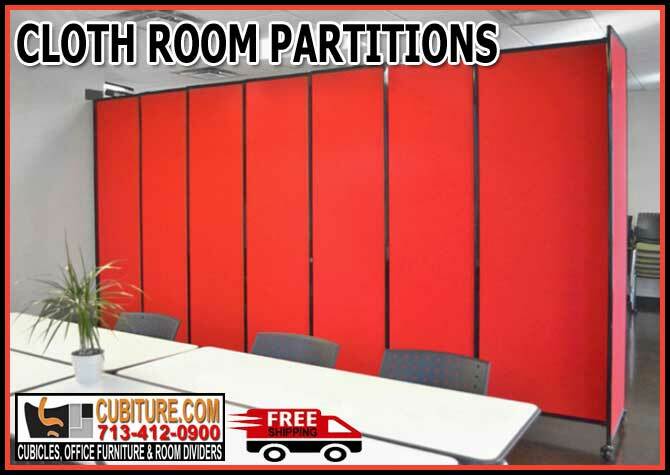 Give us a call for a free consultation at (713) 412-0900, where we can help you pick a cloth room partition from our wide selection. With every order you place, we ship to you for free. Call Cubiture today!